Eventually... why not now? 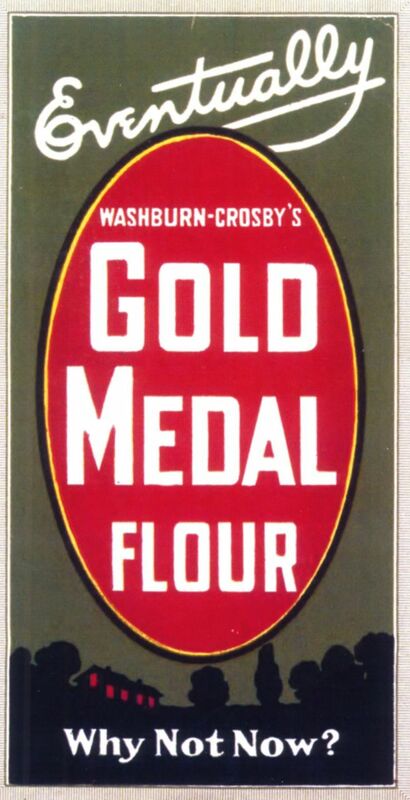 So went the popular slogan for Gold Medal flour in the early 20th Century, the height of the flour milling business upon which our fair city of Minneapolis was built. * What was once the Washburn A. Mill (the Washburn-Crosby Company later became General Mills) is now the site of the Mill City Museum, right next to the river in Minneapolis, just down the block from the Guthrie Theater. The vacant building burned down in 1991, but most of the external structure was saved. The museum opened in 2003 and showcases the history of the milling industry and the city that it helped to build. I've been wanting to visit the museum since it opened, but in typical theater geek fashion, it was theater that finally got me there. An "Eventually" Christmas: Holidays at the Mill is a unique theater experience written by talented local writer/comedian/actor Joseph Scrimshaw (whom I only recently discovered thanks to his hilarious and odd little Fringe show this summer). At just $14 for the short play, which also includes admission to the museum (an $11 value), it's a steal - for just three extra dollars you can experience the museum plus this fun little play that helps you imagine the lives of the people that worked in that very location. I love the idea of theater happening in the exact location where similar events might have taken place (see also: After Miss Julie, produced by Gremlin Theatre in the basement kitchen of the James J. Hill House); it makes me feel like I'm witnessing history, instead of just a made-up drama. The play takes place in the museum's Flour Tower elevator. If you've never been to the museum, this might seem odd - a play in an elevator? But the elevator is actually a unique way to tour the building, and, it turns out, experience theater. The bleacher-like seats in the large elevator face the opening, from which the different floors are viewed, representing different stages in the flour-making process (the museum's guided tour will give you a more detailed history that you can use as background to the events of the play, although it's not necessary to follow the play). Our guide through the play is the Ghost of Mill City Past (the charming and personable Richard Rousseau), dressed in chains, "like that other ghost in that other story being told down the street." The Ghost directs the elevator to different floors and explains a bit about the characters in the scenes, who are based on real employees of the mill, circa 1920, as described in the company's "Eventually" newsletter. The Ghost cajoles museum tour guide Anthony into taking on different roles in the scenes (Anthony is actually actor Brian Columbus, very entertaining as he slips from being just plain Anthony into the various characters). 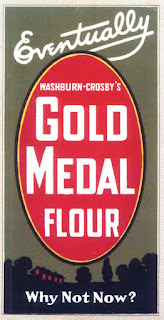 The story involves a couple of women on the "women's floor" (packing bags of Gold Medal flour) as they plan for the annual Christmas party, which sounds like it was THE event of the season. The story culminates on the 8th floor, when the audience exits the elevator and enters the Washburn-Crosby Company's party, and watches the events unfold. I've always said that theater is my window to the world, and in this case, it's my window to the world of the past. An "Eventually" Christmas: Holidays at the Mill is a great addition to the museum and helps you experience life in the mill as it was 90+ years ago, while standing in that very location. History + theater = a great day in my book. And the next time someone says "eventually" to me, I'll respond with "why not now?" Sounds like a great motto for life, as well as flour. 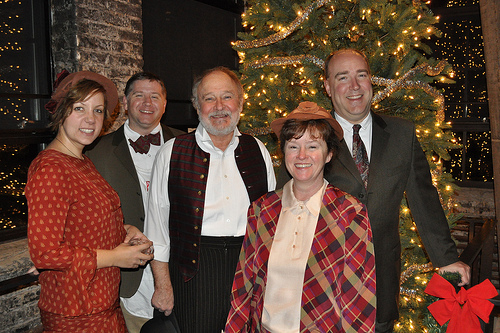 An "Eventually" Christmas continues this weekend only, three performances a night Friday and Saturday. Click here to find more info and make reservations (space is limited in the elevator, so reservations are recommended). *When you visit the museum, be sure to watch the short film by another local talent, Kevin Kling. Minneapolis in 19 Minutes Flat gives the entire history of the city of Minneapolis in an abridged version. While I would happily watch a two hour film on this topic, the under-twenty-minute version is entertaining and informative.